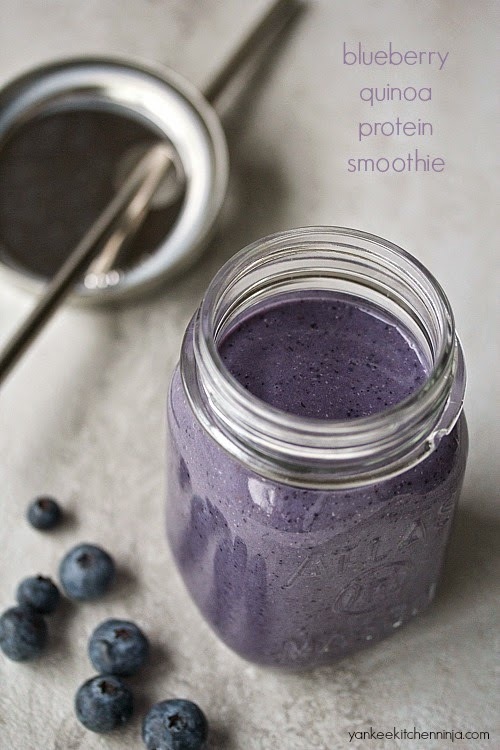 Skinny blueberry and banana quinoa protein smoothie: made with soymilk, it's dairy-free, gluten-free and refined sugar-free. I never get tired of smoothies. How about you? I swear there are an infinite number of good-for-you ingredients that can be combined to make smoothies so that you rarely need to drink the same flavor twice. Which is great, because I love drinking them both for breakfast or as an afternoon "snack", and usually what my taste buds are craving are pretty different at those two different times of the day. This blueberry quinoa quinoa smoothie fits the bill for either time of day, as it's super-simple to make, with only five ingredients. Also, it's easy to create new flavor variations simply by changing up the kind of frozen fruit you use in this smoothie recipe. I've swapped out the blueberries for peaches, mangoes, strawberries, grapes -- you name it, I've tried it. In addition to tasting great, this skinny smoothie is also loaded with energy-boosting protein. I work in all that good protein by first substituting Silk soymilk -- with 8 grams of plant-based protein per serving and no cholesterol -- for dairy milk. 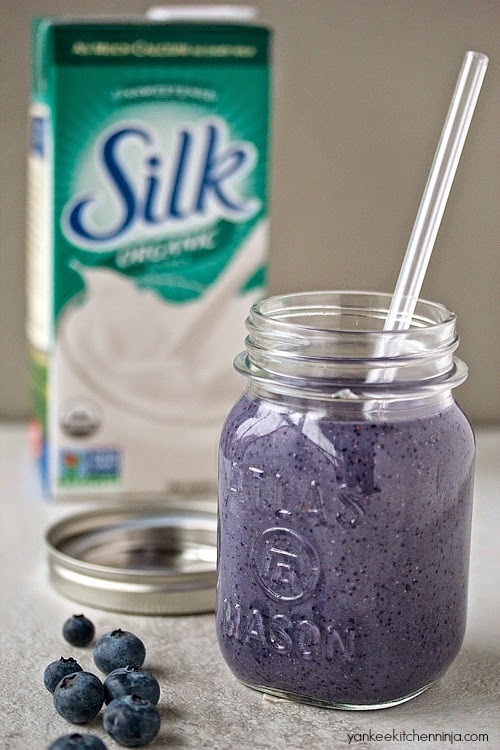 I like to use organic unsweetened Silk soymilk, but be sure to check out the full offering of Silk soy products. Then I also add cooked quinoa, much the same way that I like to use old-fashioned oats in my favorite breakfast smoothie. Plus, this smoothie is dairy-free, refined sugar-free and gluten-free, making it a great no-guilt, good-for-you snack in that long stretch after lunch but before dinner. 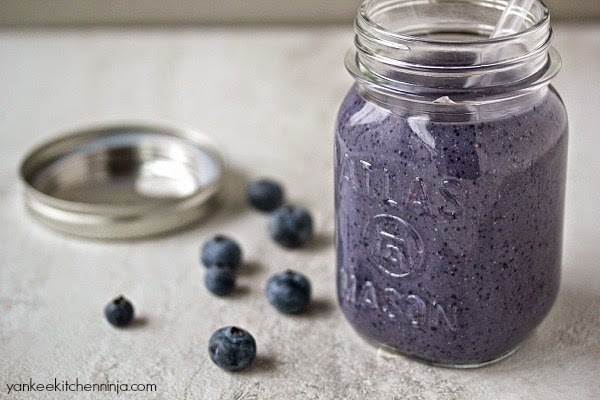 Just say no to sugary snacks and say yes to this blueberry banana quinoa protein smoothie instead! It always makes me feel good when I choose to satisfy my hunger with a skinny, better-for-me smoothie like this one that tastes like a total treat, rather than succumbing to the temptation of a handful of cookies. Wondering about the addition of quinoa? I simply make a batch of quinoa whenever I get a chance (it only takes 15 minutes), spread it out on a baking sheet to cool and then store it in an air-tight container in the fridge. Then, anytime I want one of these delicious smoothies, I have quinoa on hand. It blends really easily and adds a delicious hint of nuttiness to the smoothie as well. Do you, too, choose smoothies when the late-day hungries hit? What's your favorite way to make them skinnier and better for you? Leave a comment: The Ninj wants to know. This conversation is sponsored by Silk. The opinions and text are all mine. Add all the ingredients to a blender and process until smooth. As much as I poke fun at Lorraine for her soy milk collection, I have grown to love it. Silk soy products are first class in quality and consistency. Lately, I'll try anything that arrives in a mason jar. :-) I want to try this smoothie with peaches when the come in season. Thanks for the awesome ideas, Ninj. Happy to hear that Lorraine has made you a convert! And I love your idea of using peaches -- yummy. I used to love making smoothies... until my blender broke and I still have yet to get a new one! #fail. Totally need to get a new one so I can jump back on board... LOVE how you added quinoa in this! Dude, you can't be without a blender -- got on that! You're gonna love this smoothie (so EASY).